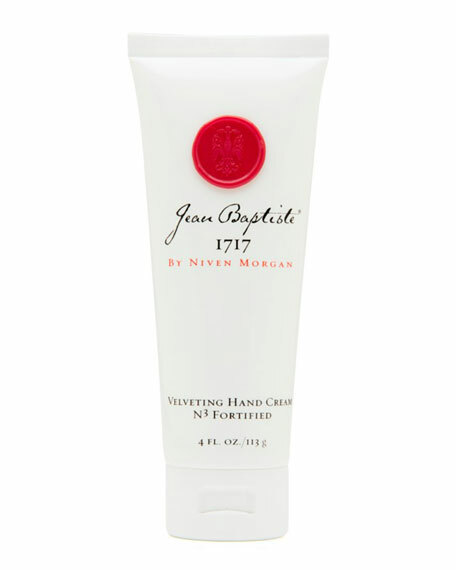 Niven Morgan Jean Baptiste 1717 Hand Cream, 4 oz. Niven MorganJean Baptiste 1717 Hand Cream, 4 oz. A young but sophisticated fragrance, Jean Baptiste 1717 evokes the seductive soul of New Orleans: oak lined boulevards, jasmined air, distant song, sweet times, love lost and found. The scent: Water hyacinth, jasmine and tuberose floating through a sensual aura: wild rose and princess lily with subtle traces of caramel and creamy vanilla, and base notes of rich woods and warm patchouli. Niven Morgan's Jean Baptiste 1717 celebrates New Orleans past and present and its founding father, Jean Baptiste le Moyne de Bienville, the aristocrat who established the city in 1717 as the capital of French Louisiana. His original settlement survives to this day as the Vieux Carré, or French Quarter. Hands feel smoother, look younger, healthier with regular use of this luxe cream. Organic aloe vera and mango butter moisturize, soften and resurface dry and overworked hands without leaving a greasy feel. A blend of natural extracts may help reduce the appearance of dark skin spots. 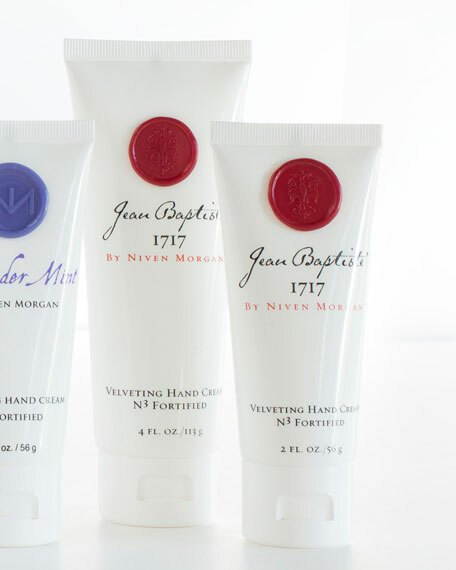 Maintain a balanced regimen of hand care with Niven Morgan Hand Soap, Hand Lotion and Hand Cream.